The Fondi OnReal Cam is a small ,lightweight, fun and entertainment digital fashion technology gadget which is essentially a wearable camera, similar to the GoPro or the HTC ReCamera, which allows you to capture and share real time videos and photos onto various social media platforms and features a smooth surface and weighs less than 25 grams. In terms of specifications, the device comes with the capability of recording Full HD videos at a resolution of 1080 pixels, through its 8-megapixel CMOS sensor. Users must add up to 32GB of Class 10 memory to the device through the microSD card slot to operate this device . With its unique shape, design this unit is currently available in Black or White colour options in South Africa. The OnReal Cam also comes with accessories such as magnet, adhesive mount, suction cup and clip, inside the box, so if you are looking for a compact device that can shoot your road trips or your extreme sports adventures, but are on a budget, the Fondi OnReal Cam could do the trick. The Fondi OnReal Cam is compatible with both Android and iOS devices and it connects to smartphones and tablets through Wi-Fi. In order to connect the OnReal camera to your smartphone, all you need to do is download the Fondi OnReal app from either the Apple App Store or Google Play, install the app, connect to a wireless network called "OnReal", enter the password to connect and you are good to go. The Fondi OnReal Cam does not have any Internal memory, a MicroSD Flash memory card with Class 10 with size up to 32GB must be purchased separately to operate this device. 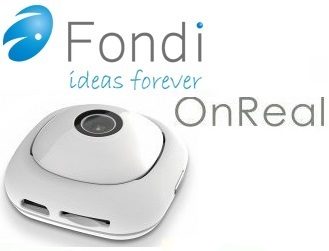 The Fondi OnReal Cam is a fun and entertainment digital fashion technology gadget which is essentially a wearable camera, similar to the GoPro or the HTC ReCamera, which allows you to capture and share real time videos and photos onto various social media platforms and features a smooth surface and weighs less than 25 grams. In terms of specifications, the device comes with the capability of recording Full HD videos at a resolution of 1080 pixels, through its 8-megapixel CMOS sensor. Users can add up to 32GB of memory to the device through the microSD card slot. With its unique shape, design this unit is currently available in Black or White colour options in South Africa.